Propelled by an unbroken string of sellouts in NFL-sized stadiums, Ed Sheeran’s ÷ (“Divide”) Tour continues to draw thousands of fans from around the world. As has been the case from the beginning of his “A” level tours, Sheeran connects with his adoring throngs through a Meyer Sound LEO Family reinforcement system provided by UK-based Major Tom, Ltd. The production team relies on the LEO Family to deliver the dynamic punch of the music while creating a sense of connection between Sheeran and his fans. Marsh continues as Sheeran's trusted FOH engineer, a post he has held for more than six years. He also mixes Sheeran's monitors on the same DiGiCo SD7 console, and supervises all aspects of the tour’s technology as production manager. Marsh's partner in fine-tuning the tour's massive LEO Family rig on a daily basis is audio systems engineer Charlie Albin. The foundation of the current touring system is formed by four arrays of 18-each LEO line array loudspeakers with low end augmented by 42 1100-LFC low frequency control elements: two flown arrays of 9 each and two end-fire arrays of 12 each on the ground. LEOPARD (8), LINA (20), and UPA-1P (2) loudspeakers supply fill from the stage as needed, while 56 MILO line array loudspeakers are deployed on four delay towers. For onstage foldback, the tour also carries two MJF-212A stage monitors and two 900-LFC low frequency control elements. System drive and optimization is entrusted to a pair of Galileo GALAXY AES master processors, with stage array processing from eight GALAXY processors and delay processing by four Galileo processors. The tour also carries a SIM3 audio analyzer for fine tuning response before each concert. Sheeran uses a Sennheiser 9000 Series digital wireless system for his guitars and on-stage microphones. The primary vocal mic has a 9235 dynamic capsule while the secondary mic (for loop-building) has an MMD 945 super-cardioid capsule. His intricate multi-channel accompaniment is built in layers using a sophisticated, computer-driven Chewie II Monsta Looper pedal system. 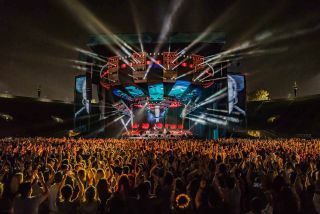 The 2018 North American leg of the ÷ Tour was launched on Aug. 18 at the Rose Bowl in Pasadena, Calif., where Sheeran thrilled over 62,000 of the faithful. The leg continues through the final show at Mercedes-Benz Stadium in Atlanta on Nov. 10, with a total of 24 shows in 21 cities. The ÷ Tour, which started in March 2017, has shattered Pollstar’s all-time record for mid-year gross receipts. Sheeran’s stratospheric popularity is further reflected in the recently announced nominations for the American Music Awards, where he is a leading contender in six categories: Artist of the Year, Tour of the Year, Favorite Male Artist (pop/rock), Favorite Pop/Rock Album, Favorite Song and Favorite Adult Contemporary Artist.